Ideals and Ideologies: A Reader is a comprehensive compilation of classic and original readings representing all of the major 'isms'. It offers students a generous sampling of key thinkers in different ideological traditions and places them in their historical and political contexts. Used on its own or with Political Ideologies and the Democratic Ideal, the title accounts for the different ways people use ideology and conveys the ongoing importance of ideas in politics. 2.5 Niccolò Machiavelli—What’s Wrong with Princely Rule? 2.6 John Adams—What Is a Republic? 4.28 Edmund Burke—Society, Reverence, and the "True Natural Aristocracy"
8.52 Frederick Douglass—What to the Slave Is the Fourth of July? 9.66 James H. Cone—Whose Earth Is It, Anyway? Terence Ball received his Ph.D. from the University of California at Berkeley and is Professor of Political Science at Arizona State University (emeritus). He taught previously at the University of Minnesota and has held visiting professorships at Oxford University, Cambridge University, and the University of California, San Diego. Richard Dagger earned his Ph.D. from the University of Minnesota and is now Professor of Political Science at the University of Richmond. He has taught at Arizona State University and Rhodes College, and has been a faculty fellow of the Center for Ethics and Public Affairs, Tulane University. Daniel I. O'Neill holds a Ph.D. from the University of California at Los Angeles and is now Associate Professor of Political Science at the University of Florida. An anthology of classic readings, Ideals and Ideologies has itself become a classic. This is a textbook, but it is also a deep reflection on and of our political world. Introducing students to the powerful ideas that have mobilized and inspired political actors and causes across the contemporary landscape, it is a wonderful teaching tool and useful reference guide. Chosen for accessibility as well as significance, and updated with important and timely new voices, each reading is expertly introduced by the editors. This latest edition maintains the high standards one has come to expect from Ball, Dagger, and O’Neill. This comprehensive, up-to-date, judicious selection of sources reveals alternative ideologies in their contexts and especially as practically applied in American discourse and policy. An important collection with concise introductions, edited by some of the most informed American teachers and scholars of political theory and political thought, it is well-suited for student use and for anyone seeking to make sense of the evolution of conflicting worldviews and their consequences. 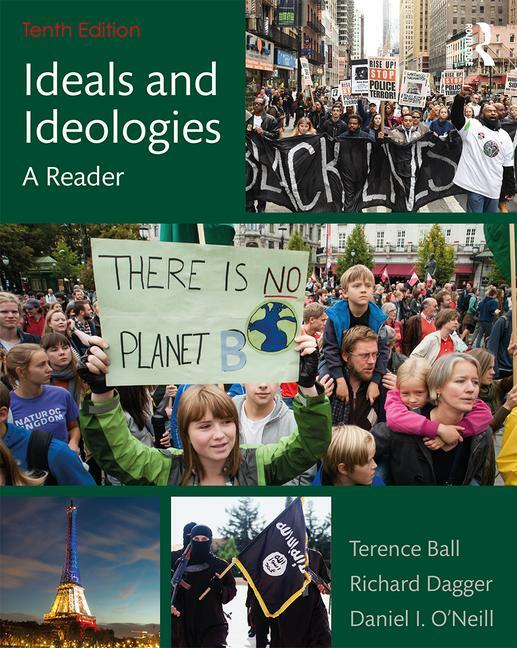 The leading introductory textbook in political theory for good reason, Ideals and Ideologies continues to provide the accessibility and clarity demanded by students without sacrificing the richness and rigor desired by faculty. The tenth edition maintains the hallmarks of the previous versions: a comprehensive yet manageable collection, featuring classic statements alongside less orthodox voices and visions, all updated with new "-isms" and thinkers for the contemporary reader, who will appreciate the insightful introductions, helpful annotations, and modernized translations. This long-essential reader continues to demonstrate the relevance of political ideologies for the present. Combining classic texts in the history of political thought with decisive declarations and manifestos, the most recent edition invites study of new texts from Krugman, Sanders, hooks, and Pope Francis as well as the Manhattan Declaration and ISIS's Declaration of a Caliphate.